Our fast-track courses are perfect learning learning Norwegian as quickly and efficiently as possible. As a student, you will soon become more confident and able to use your language skills independently at work and in your social life. Why choose Norwegian courses at Lingu? Our Norwegian courses are designed for professionals who desire a fast-track Norwegian language course. They are suitable for persons with higher education and who have work and other commitments. Our goal is to expand the student's career opportunities by equipping them with solid, practical language skills in Norwegian. When registering online, you need to pay with credit card. If you rather want an invoice, please contact us. All students must buy the corresponding course materials and bring to the classes. We recommend that you order the books online. You can also buy your copy when you arrive for your first class. B2: All materials are available online and included in the course fee. 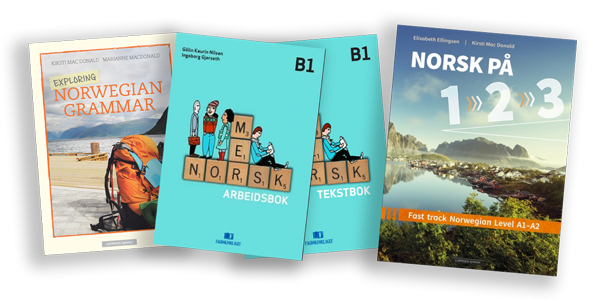 We also recommend Exploring Norwegian Grammar as a useful grammar reference in English. Lingu is accredited by Kompetanse Norge (formerly Vox). Both the online and offline training follows the official curriculum for Norwegian language and social studies for adults. You will get a course certificate at the end of the course, which is valid for permanent residence and citizenship applications in Norway. Here are our available fast-track Norwegian language courses in Oslo. Choose a level to read more and register. If you are not sure about your level, you can take our free placement test. The B1 level is the most exciting one! Most students find the key to the Norwegian language when attending this course. The course includes both the B1 modules. You will work on grammar and technical aspects of the language to make sure that you are enhancing your spoken skill as well as your listening comprehension. The B2 course is all about finalizing your understanding of the Norwegian language. Improve your conversational skills and enhance the technical part of the language. You will be equipped to handle all common language situations in Norway and do so confidently.